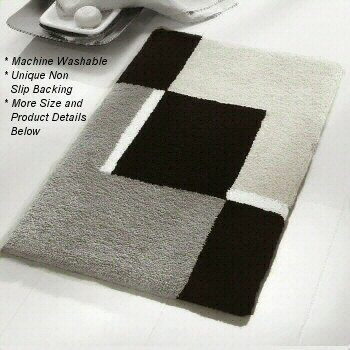 Contemporary geometric intersecting block pattern bathroom mat. Platinum: Platinum grey is the darker grey tone. A true grey with a very light flannel grey in the opposite corner. The diagonal blocks are black with accent lines in white. Coordinated Lid Cover: Solid Platinum Grey - the medium grey tone in the rug design. Ruby Red: Deep bright ruby red in one corner and a slightly lighter red tone in the opposite corner. The diagonal blocks are a deep wine red with accent lines in white. Coordinated Lid Cover: Solid Ruby Red - the deep bright red tone. Marine Blue: Rich marine blue color in one corner and a lighter medium blue tone in the opposite corner. The diagonal blocks are a deep dark blue with accent lines in white. Coordinated Lid Cover: Solid Marine Blue - the rich blue tone. Lavender (limited availability): Deep purple in one corner and a lighter lavender purple tone in the opposite corner. The diagonal blocks are a deep dark purple with accent lines in white. Coordinated Lid Cover: Solid Lavender - the light purple tone. Toffee: Toffee like a toffee candy tone in one corner and a very light champagne beige tone in the opposite corner. The diagonal blocks are a deep dark brown with accent lines in white. Coordinated Lid Cover: Solid Toffee. Elongated lid cover for the Dakota design is a solid color.